The air you breath inside your home plays a vital factor in your overall health and well being. You wouldn’t sacrifice your health by not following your doctors instructions. The same can be said for the air in your home, where you spend the majority of your time. When you sacrifice the quality of the air filters you use, it drastically impacts your air quality, spreading allergens, microbes, air born viruses, and in return, affects your health. This Memorial day, when your celebrating and remembering our fallen hero’s, remember what they had to go through, mentally and physically. The chemicals, ash and soot they had to encounter and breath into their bodies. Fast forward to present time, houses now are becoming more and more sealed tight, trapping those pollutants in your home and circulating them throughout your house. If the majority of your time is spent in your home, wouldn’t you rather breath clean air instead of air polluted with viruses and allergens. Those brave soldiers didn’t have a choice in what they were breathing into their bodies, but you do. Here at High Performance Heating, we treat our clients like they are family. We don’t want our family breathing in polluted air because they weren’t informed and bought discount Walmart air filters that wouldn’t trap clumps of dust. Which is why we are an authorized Aprilaire Dealer, offering high quality media filters that trap up to 98-99.6% of pollutants in your home. Thing’s like virus’s, allergens and pet dander, which even if you don’t have any pets can be transferred from people who do, don’t stand a chance. Aprilaire media filters are designed almost like a screen door if you will. Millions upon millions of screens on top of each other, making it nearly impossible for anything to pass through, even microscopic virus’s and mites. Every air filter you buy at Walmart or Lowe’s, are thin and if you hold them up to the light, you can see right through them, try that with a Aprilaire and you won’t be able to see through it. The featured picture for this article even shows you what happens when you hold a basic filter up to the light, your able to see the trees through the filter. If you were to take the basic air filters apart the tissue they use would barley cover a table, if you were to take apart each layer or screen if you will, of an Aprilaire media filter it would be enough to cover the whole floor of our shop (which isn’t small). We understand that not everyone can invest tons of money, but instead of spending money on temporary entertainment, invest your money in something that will last long term and increase your overall health. Regular air filters practically need to be changed once a month because of how thin and easily they fill up with dirt and pollutants. Aprilaire media filters only need to be chanced once a year and will trap more pollutants than any other filter ever will. There are also other ways to prevent mold and bacteria from growing inside of your heating and cooling equipment, UV lights are a great way to prevent mold from growing inside of your HVAC unit. Preventing mold from forming inside your home is critical to maintaining your health. When our highly trained HVAC technicians recommend products to Rochester home owners, we take all aspects of your home into consideration and never try to push products that you don’t need. But our HVAC technicians almost always recommend Aprilaire media filters and UV lights to help you combat illnesses and maintain a healthy home. Give us a call today 585-426-3004, we’ll send a highly trained HVAC technician right over to asses and determine the best course of action for your home. Breathing easy and staying healthy has never been easier. This Memorial day celebrate with clean air and remember our fallen hero’s and the ones that were able to make it back home to their loved ones. Rochester NY’s high humidity levels makes air conditioning a necessity. If you don’t own air conditioning, don’t you love the feeling when you walk through the doors of an air conditioning building? Wegmans especially keeps their store at a perfectly cooled temperature. But let’s face it, you can’t stay there all day and certainly not all night despite how good the A/C feels. And you know as soon as you exit the building you’ll be faced once again with not only the heat but also the ragweed, pollen, mold and every other allergen in the Rochester area. For those of you with allergies, I bet the summer isn’t as fun as it could be otherwise. You may not realize the reason you enjoy Wegman’s A/C so much is because it includes a HEPA attachment, a High Efficiency Particulate Air. HEPA attachments purify the air from allergens, especially ragweed. 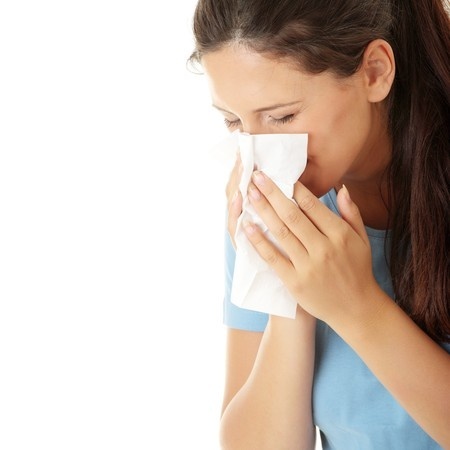 It filters out debris that causes health problems, which often lead to pesky allergy symptoms such as sneezing, a runny nose, itchy eyes, and coughing. More than 55% of the population deals with these issues every summer. A HEPA attachment benefits those both with allergies and without since it not only eliminates allergens but also cools the air during the summer. Although Wegman’s air conditioning is the essence of comfort, go home to your own A/C and ensure it includes a HEPA attachment. Call High Performance Heating, Cooling and Hydronics (air conditioning installation Rochester) at (585) 509-1364 to install a HEPA air filtration system in your home and enjoy fresh, cool, clean air in the comfort of your own home. The temperature of the air in your home is vital to your comfort level. Whether you like it cool and comfy at night or warm and toasty as the snow falls, it really is a matter of personal preference. However, just as important as the temperature of the air that is being pumped through your vents, is the quality of that air. 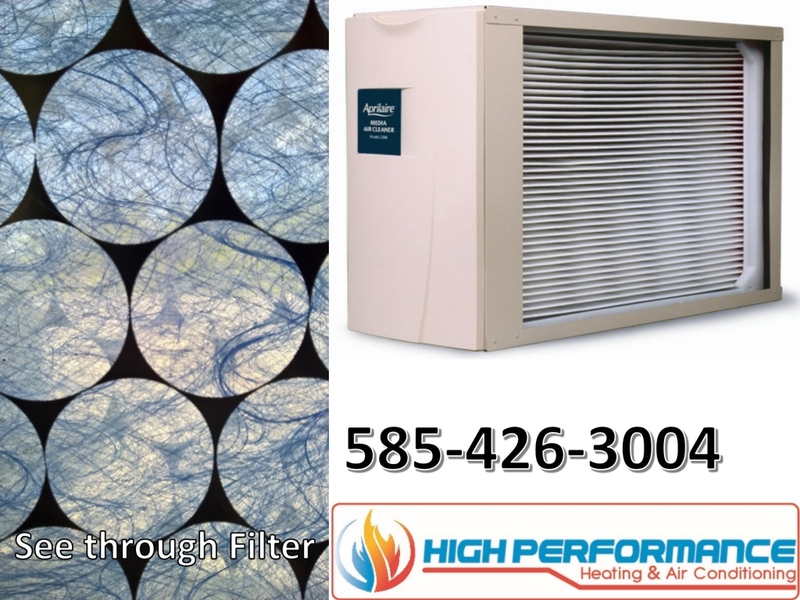 The air filters Rochester homes have in their heating and cooling systems determine the quality of that air. Every heating and cooling system in Rochester homes needs to have clean air filters to operate correctly and at optimal levels. Air filters Rochester systems have can block out debris, dirt and even allergens when they are changed regularly and used cleanly. If ignored, the air filters Rochester homes have become blocked over time and all of that built up dirt, dust, and debris has real effects on the system. Those blockages make the system work harder to pump the air and keep the temperature of the air consistent with what you want. When the heating or cooling system has to work harder just to keep a steady level of performance, the life span of the system can actually be compromised. Letting the professionals at High Performance Heating, Cooling and Hydronics check and change the air filters Rochester systems have can go a long way in preserving and protecting how those very costly systems work. Because air filters used in Rochester home systems are much more affordable than replacing an entire air conditioning or heating system, it simply makes sense to have the air filters replaced as needed. 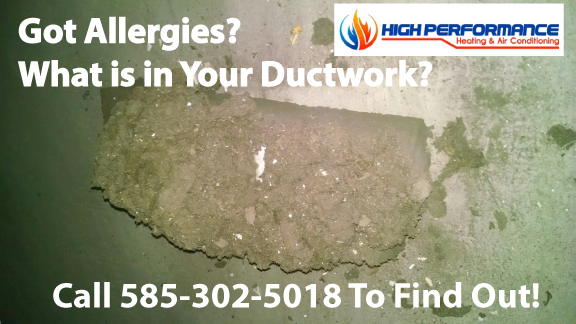 Every time High Performance Heating, Cooling and Hydronics services, cleans, or maintains your heating and cooling systems, we will thoroughly check the air filters those systems use and ensure you always have clean performance. Some people may not realize the air filters home systems need are just as important as the systems are. You can spend a fortune on your heating and cooling system. But, if you never pay attention to the status of the air filters in the system you have, you could be throwing good money away. You could also be exposing your family to air that isn’t nearly as clean as you think. The air filters Rochester home systems need are necessary for a number of reasons. First of all, they trap any kind of dust and debris that could pollute the air being pumped through a system. Once an air filter is full or dirty and in need of replacement, that dirt and debris can hinder its performance. This hindrance causes a strain on the system. 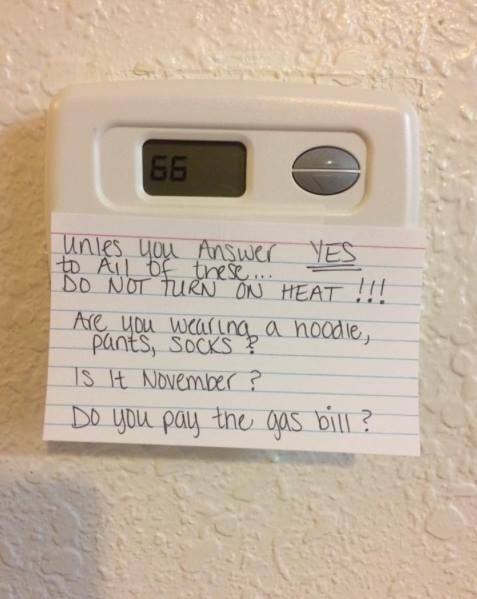 Basically, it makes the heating or cooling system work harder. If the system has to work harder to meet the needs you place on it, it simply isn’t going to last as long as it should. To ensure you are getting the best air flowing through your vents and into the rooms you and your family spend time and also ensure your heating and cooling system isn’t having to work overtime, simply have the filters changed regularly. Keeping the air filters changed as they should be also helps ensure the air in your home is free from dirt, dust and allergens that may directly affect the health of those in the home. The specialists at High Performance Heating, Cooling & Hydronics can evaluate your current filters and set up a schedule to have the filters replaced and working as they should. With us on board and keeping track, you don’t need to. The professionals at High Performance Heating, Cooling & Hydronics can be the all-around doctors you need to get the most out of each and every system in your home and also meet all of your air filters Rochester home needs.